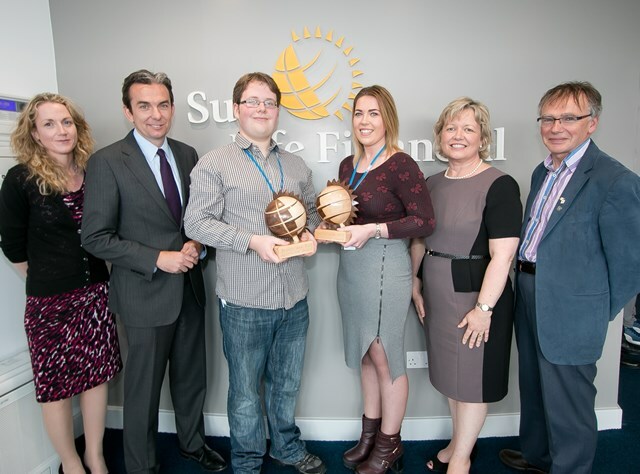 Sun Life Financial (SLF) have worked alongside Waterford Institute of Technology (WIT) to promote enterprise and innovation among Computing and Mathematics students and this was never more evident than at the fourth annual Sun Life Enterprise & Innovation Awards. Two outstanding students picked up the annual awards: the Innovation Award for a project that demonstrated uniqueness went to Sophie Renshaw from Charleville, Co Cork for her project ‘Deploying Openstack on Small Scale Architecture’ and the Enterprise Award for a project that demonstrated commercial potential went to Samuel Haycock from Clonmel, Co Tipperary for his QRLang project, allowing for complete games to be coded into a QR code. Competition for the two awards was fierce with 20 projects submitted from a pool of final year honours undergraduate projects with 10 finalists invited to showcase their projects at an exhibition at Sun Life’s newly refurbished office in Waterford.